in Heroes Slash Fanfiction Awards 2010! 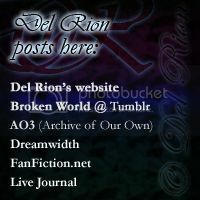 Thank you to the people who submitted the fic, voted for the fic - and everyone who has read the fic and followed the Broken World -series up until now. (A new part, The Error of Sun Tzu, was just added today, and more is planned and on the way). Lol, thanks XD I'm feeling so proud that someone thinks that!